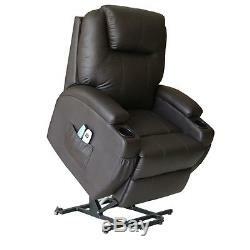 Shiatsu Massage Chair Power Lift Electric Recliner Sofa Wall Hugger Lounge Wheel. MOSTLY, THEY WILL DELIVER THE PACKAGE AT FRONT DOOR, GARAGE ECT. IT NEEDS TO BE MOVED TO HOME BY YOURSELF, PLS KINDLY THINK TWICE BEFORE MAKE YOUR ORDER IF IT'S INCONVENIENT FOR YOU TO MOVE PACKAGE. 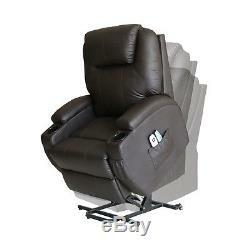 The power lift recliner chair is a 15 in 1 function chair. Integrated a powered lift mechanism could lift the chair up easily, especially for elderly people. Two separate controls reduce the malfunction rate. 8 massage points provide massage of your whole body. 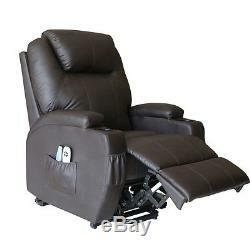 Infinite reclining position provide the almost choice for your to find your comfortable angel. 100% brand new and quality. 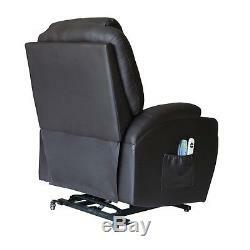 Made of PU leather and high density foam. 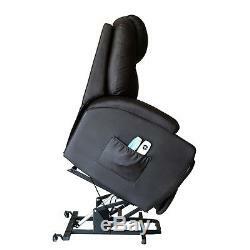 Cushions are filled with high density foam, which is very soft and comfortable. 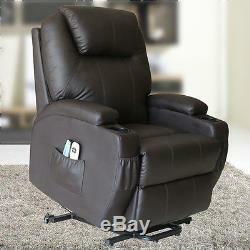 4 storage pockets and 2 cup holders on each armrest providing place to rest your drink when you relax. Integrated a powered lift mechanism that could push the entire chair up from its base to help the senior to stand up easily. Areas of focus (8 massage points) as well as a high or a low speed on each area. 5 modes (pulse, press, wave, auto, normal) that you allow you to choose a preset massage. Vibrating nodes providing a complete massage to comfort. A heating function at the lumbar part, which helps relax your body and reduce pain. 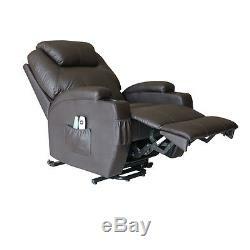 Adjustable backrest reclines and leg rest comes out for you to lay back. 2 different speeds, high and low, as well as heated massage. Function of timer 15/30/60 mins, free to set the time of operating. Chair holds up to 300 pounds. Easy removable with 2 wheels. Material: PU leather+high density foam. 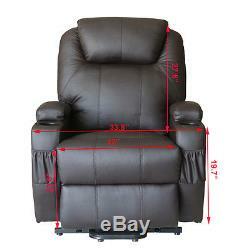 Seat dimensions : 21.5"L x 22"W. 1 x massage chair, 2 x remote controllers, 1 x assembly instruction, 1 x product instruction. 1 There will be 1-3 cm normal minor deviation due to manual measurement. 2 The picture is of actual products. But minor color difference maybe exist due to different light and monitor setting. A best solution will be provided to you after we get information from you. We may require pictures or video of defective /damaged items so that we could check if there is any improvement on this item. Thanks for your kindly understanding. If a replacement unit or replacement parts are requested, please be aware that the fulfillment timeframe is based on product availability. Customer 100% satisfaction is our first priority and goal. We are always working hard for maintain high standards of excellence and resolve your problem in best way. If you have any problem of the item, pls feel free to let us know before leaving your feedback. We will try our best to solve your problem. 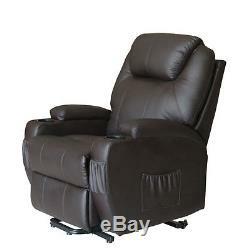 The item "Power Recliner Lift Electric Massage Chair Vibration Heated Sofa Lounge Brown" is in sale since Monday, March 13, 2017. 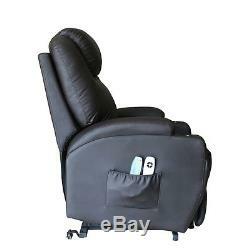 This item is in the category "Health & Beauty\Massage\Electric Massage Chairs". The seller is "bestoreus" and is located in CA&NJ. This item can be shipped to United States.